Why Kenya? The author had the opportunity to travel to Kenya several times in 2014 and 2015. So why not take a complete sample of ALL the EXPO 2000 Hanover projects in that were located in this beautiful East African Country? It would have been virtually impossible to take a fair sample from the 487 projects worldwide for a “journalistic evaluation”. 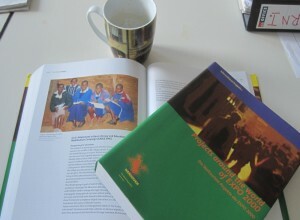 It was a book that has brought me to do research in many parts of Kenya. It has over a thousand pages in two volumes. Its title: “The global projects of the Expo 2000 in Hanover”. It outlines the top 500 ‘aid projects’ across the globe as chosen by an international jury at the time. 15 years later I’ve decided it would be interesting to see how the projects are doing. Of course, I cannot visit all 500 projects. So I decided to concentrate on programmes in Kenya. I call this “the Aid Audit”, because each of the projects wants to aid the world to become better. Many of them are related to the Millenium Development Goals that were proclaimed in 2000. But have they kept their promise: to relieve misery and poverty or to drive progress forward? Browse these pages to see and comment. And listen to the radio documentaries I have produced about the issue.